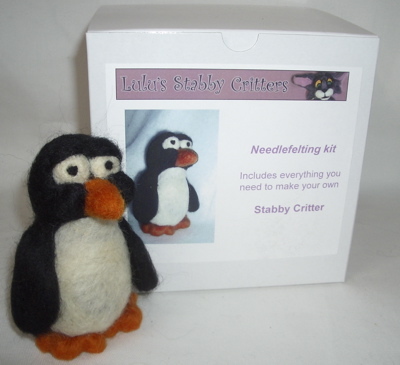 So I hope Kim has fun making her little penguin……..and I hope to get more kits made and up in the store ASAP. 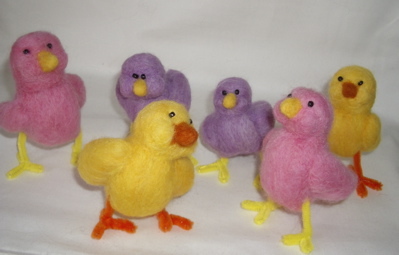 Ok, and now the goodies for me……..I am so excited with my latest purchase from Etsy seller MissBeahavin I just had to share it with you. 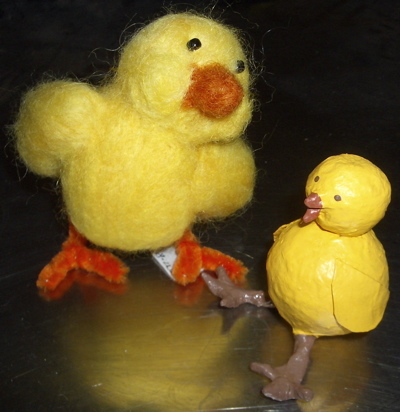 It’s the little Papier Mache chick pictured with my little peeper to give you an idea of how precious he is. I just love MissBea’s work and he is the 2nd of her pieces that I am thrilled to own, and I am sure there will be more to come as she is so talented. He’s at the vet today saying goodbye to his “boys” awwwwww I always feel guilty about taking the kitties to get this procedure……but I realise it’s the sensible thing to do……..
Maybe it’s because of my diet or maybe it’s just because I am food obsessed…….probably the latter. 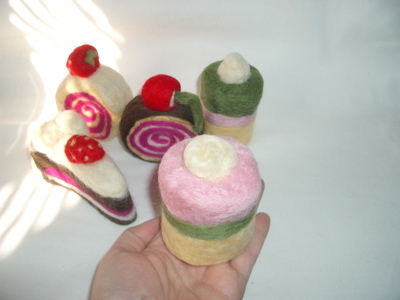 But I have really gotten into making felted pastries. Don’t worry I haven’t gotten so food deprived that I am risking hairballs, they are going to be heading to a new store opening in Madison (along with some critters of course) and I can’t wait to see them there. MMMmmmmm cakes, s’not fair…………I wanna cake………Dammit!!!! Curse my huge bottom and wibbly thighs. 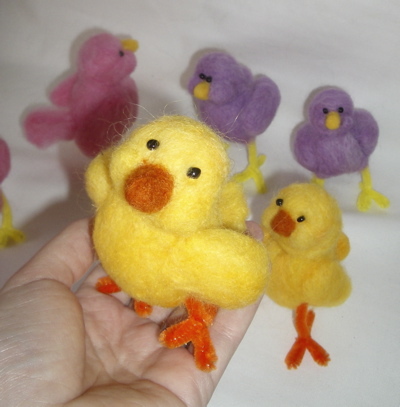 I love holding the little fellers, it makes me feel like Mary Poppins in the scene where she is singing A spoon full of sugar and the birdie whistles along with her………..anyway I wanna make a few more of these little guys, just cos’ I like ’em. 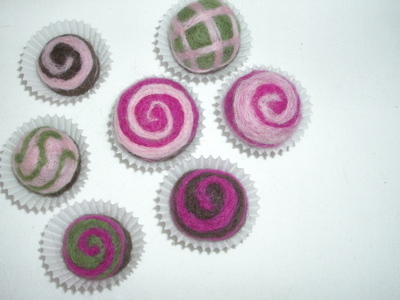 I also made some candies……….although these might cause a hairball so don’t eat them!!! 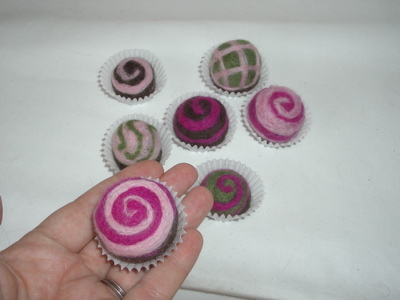 These are for a little something I’ll let you know about later……..aren’t I a tease? 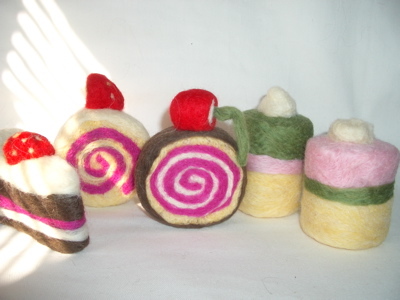 I do really love the Craftaculars…….mostly because the other vendors and organisers are brilliant. 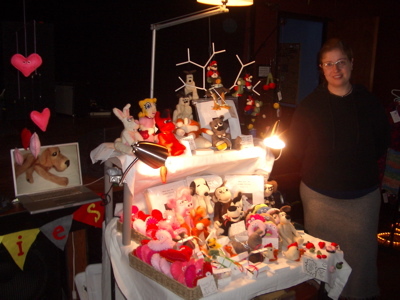 Special thanks to Glitterworkshop and Ekra for again putting on a fantasticaly organised show. So upon seeing the piccies……..the diet has started (again) waaaaaaa . I got some fantastic cards and pins from Space Oddities and I loved that I was lucky enough to be beside Kitty Girrlz yarns‘ booth again she really is fantastic on her spinning wheel and she had some fantastic valentine yarn with kitty beads through it which must look fantastic knitted up……..damn my lack of knitting abilities. After the show and on the recommendations of a lovely customer we headed on over to Brasserie V for a few Belgian beers……yum, I highly reccommend you check it out if you are a fan of decent beer and the food was fantastic too. 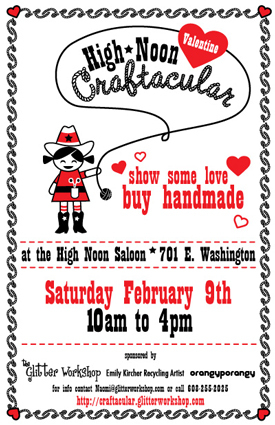 Remember tommorrow is the Valentine Craftacular at the High Noon in Madison WI where me and the critters (and 20 other brilliant crafters) will be from 10 am until 4.00pm so if you are in the area please pop on over and say hi. So today is the crazy hectic job of packing all the critters up (something they are not that keen on) and not forgetting any show essentials like extension cords and tape, and trying to keep everything in a reasonably easy to find order……..not my strongest point. 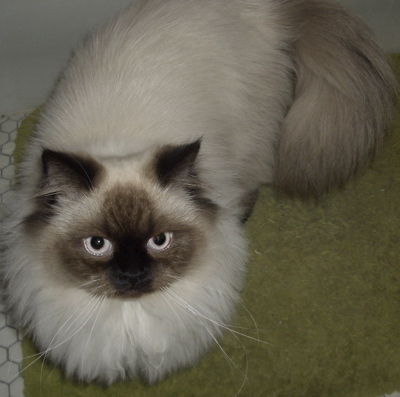 You are currently browsing the Stabby Critters weblog archives for February, 2008.